Lets face it you didn’t really think I was going to promote James Cameron’s preachy space film. I am also not promoting the live action version of The Last Airbender, because even if it was okay it would still be one step away from the real thing. Avatar: The Last Airbender. This is by far the highest quality American cartoon series I have ever seen. Batman: The Animated Series is for me a blue print for Batman. However Avatar seems to be one whole step up from that. Mainly due to a definable arc. Batman has excellent stand alone episodes and on a episode to episode basis is a match and some times betters Avatar. However Avatar is very consistent in quality and constantly impresses. What doesn’t delight is the shoddiness of the UK transfer. The later discs are far better, but expect bad interlacing and jerky motion in the first handful of discs. Give it a go and if you have kids old enough to get it, watch it with them. My good friend John got me a GameStation voucher for Christmas. So just after Boxing Day I headed into the Kirkcaldy to see what I could get with it. I managed to pick up Valkyria Chronicles for tidy price of £19.99. ‘Bargain’ I thought. I am no strategy fiend, in fact I am pretty bad at them. I have tried a couple of RTSs in the past and a strategy RPG in the form of Ring of Red for the PS2. Never with much success. However I had hope after hearing that Valkyria Chronicles was developed by much of the Skies of Arcadia team. Which is my favourite game of all time. Please bare in mind this is the game that got me to try and try again Japanese RPGs. So they could make just about any genre (bar rhythm music games) and I would play it. Valkyria Chronicles is awesome, wonderful and lovely. The art style is inspired, the characters almost universally likable and the game play somewhat unique. It is a Strategy RPG, but with real-time moves and aiming. It’s parallel world of the Second World War could have been crassly handled, but they don’t pull their punches in delivering some hard truths. I am currently half way through, so no doubt I am in for some exciting times. You Should probably switch on Flash or Visit AppleGeeks. Hi there LTNS. I have been rather lazy in updating. I have started getting into Gundam lately. I never really bought into Wing or the older series, although the 2D beat-em-up for the SNES was pretty good. 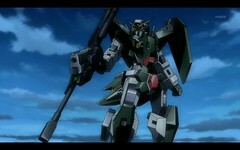 Gundam 00 kinda broke my back when it came to Gundam, it seemed like quite a nice series so I caught a couple of episodes. It broadcasts in HD and looks fantastic on my monitor. I like the characters and I really am starting to get the Gundam’s they look better on reflection. Anime Central have been broadcasting Gundam Seed, it’s older with a few more tried and tested cliches than ’00’, but for free who cares. I am really back into my mecha stride, right now I am really weak against the Revoltech figures. 498Fucking hell this is good, I’m sorry to swear online, but this is THE toy I would want out of any other. Guess what I they were selling it in Edinburgh for £18. This thing is awesome. The joints are far beyond your bog standard figure, You get all the kit, the revolver the Stun Baton (extended or collapsed), a variety of hands, a base for stabilization in extreme postures. It just rocks! The UK Anime industry we are told is currently in a wonderful new era, expanding and growing like never before. Many series are very polished and certainly have a chance of main stream success. One such series is Eureka Seven. I have been watching it on funsub since it started and I really have been looking forward to a UK release. The US release is being handled by Bandai who have been bringing out some great value special editions featuring the DVD, Manga, Soundtrack and T-Shirt. I was hoping for a similar UK release. So I toddled off to Beez the UK distributer. I would say the site is awful, but there isn’t even one and hasn’t been one for over 12 months! How can Beez expect anyone in the UK to take them seriously when we can’t even find out basic information about their local presence. Many of the other sites are barely better. MVM handle high profile releases like Full Metal Alchemist and Trigun. Having tried their excellent Works taster packs you would have thought their website would scream fun and variety. However a grey and awful world presents itself. Whilst it isn’t hard to navigate, why would you want to? It looks worse than most fan sites and is horrendously unprofessional. Though whilst it doesn’t resort to frames, it does use image only links and some of the worst colour choice I’ve seen on a ‘professional’ site. Manga UK seem to still be living in 1999 super frames land. I’m surprised they haven’t added midi to the site. I realise they haven’t been in the best of health lately and it is wrong to kick a guy when he is down. Seriously though, could you not buy an off the shelf site that would look and work better? Whilst it is nice that they are discounting VHS tapes, I hardly think it warrants primacy before all other options. Bottom aligned menus are just annoying as hell. Their Mini-sites are okay, but they don’t make up for the main site. ADV inherited a site from their US parent that whilst not amazing, does the job and is what I would have expected from MVM, Manga and Beez. To be honest I was not that interested in their current releases, but at least their site enticed me in enough to look around and maybe consider titles I otherwise would have ignored. Unfortunately the one UK company that has a major clue in terms of web design and standards compliance isn’t a dedicated Anime company. Optimum released the recent Appleseed film and the The Studio Ghibli Collection. The site is light elegant, accessible and modern. I love the design, I wish I could design that well, it is simply on another level compared to the others. Unfortunately to see a full on Anime company that does have a clue and isn’t from the US or Japan you have to go to Australia and Madman Entertainment. Madman handle a huge amount of releases, that are usually split up between the various UK companies. They not only have a great main site, but they also produce some of the nicest Flash supporting sites I have seen in ages. We have fantastic designers in the UK some of the best in the world, why the hell aren’t the UK Anime industry using them?